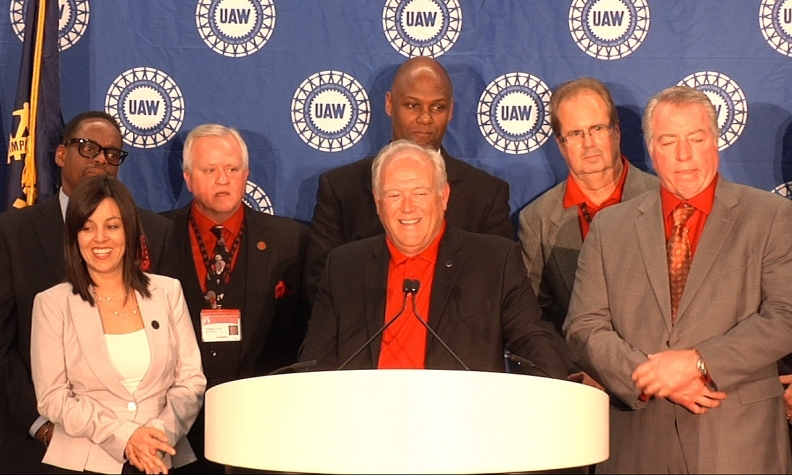 Pattern bargaining is essential to a level playing field, UAW President Dennis Williams, center, said after the union wrapped up its two-day bargaining convention in Detroit this week. DETROIT -- UAW President Dennis Williams said Wednesday the UAW will try to negotiate labor contracts with the Detroit 3 later this year that are identical -- a goal made difficult because each automaker has different labor costs largely as a result of the lower-cost, entry-level pay scale. At a press conference following the union’s two-day bargaining convention here, Williams said it’s important to bargain contracts that put each of the companies on the same competitive plane. That way, they can compete on the quality of their vehicles and customer satisfaction rather than on differing labor cost rates, he said. Negotiating a pattern agreement across all three automakers will be difficult. Fiat Chrysler Automobiles enjoys about a $10-an-hour labor cost advantage over domestic rivals Ford Motor Co. and General Motors, according to the Center for Automotive Research in Ann Arbor, Mich. The main reason is that FCA uses a much higher percentage of entry-level Tier 2 workers than either Ford or GM. About 42 percent of FCA’s hourly U.S. work force is Tier 2, while it’s 29 percent at Ford and 20 percent at GM. FCA has benefited from a 2009 pre-bankruptcy deal with the UAW that allowed it to suspend a cap on Tier 2 hiring at about 20 percent of its total work force. With the cap gone and U.S. vehicle sales growing since then, FCA has hired several thousand workers, all of them under Tier 2 wage and benefit packages that are roughly half the compensation paid to veterans, or Tier 1 workers. Tier 2 workers earn wages of between $15 and $19 an hour vs. $28 an hour for Tier 1. GM also had its Tier 2 cap suspended in 2009, but it has not been able to take advantage because it had several thousand workers on layoff at the time of its bankruptcy and had to re-absorb them first before hiring Tier 2 employees. Ford never had its 20 percent cap lifted in 2009 because it avoided bankruptcy. The company recently had to promote about 500 workers from lower-paid Tier 2 status to top-paying Tier 1 because it had exceeded its cap. Consequently, labor contracts of the Detroit 3 are far out of pattern with one another. Getting them back in pattern will be tricky in just one bargaining cycle, David Cole, chairman emeritus of CAR said this month. The costs and needs at GM, Ford and FCA are now so disparate that it may take more than new contract to get them in sync. The union agreed to two wage tiers during talks with the Detroit 3 in 2007. The UAW’s current four-year contracts with the Detroit 3 expire in September. The UAW bargaining convention that concluded here today marks the unofficial start of negotiations. Thousands of delegates attending the meeting made known their desire for a pay increase and either a roll back or elimination of Tier 2. Williams told reporters that wage gains are always a priority during negotiations. He and his leadership team will face Detroit 3 bargaining counterparts not only concerned about the competitiveness and labor costs of their domestic rivals but non-union U.S. auto plants operated by German, Japanese and Korean carmakers. CAR estimates that GM and Ford have hourly labor costs that average about $58 vs. the high $40s for FCA and transplant automakers. Williams told reporters the billions of dollars in profits being generated by the Detroit 3 mean more to him in bargaining than any labor-cost disparity with the foreign carmakers. “Well, I’ve been around long enough to know a little about margins and profits,” Williams said.